SECMOL celebrated its three decades of success in improving the system of education and dropout youths on October 11 at SECMOL Campus, Phey. 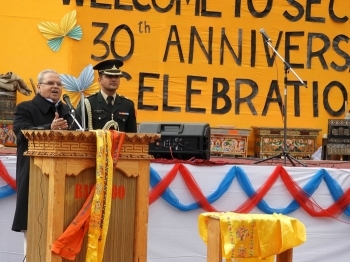 Satya Pal Malik, Governor, presided over the 30th-anniversary celebration of SECMOL, as chief guest. Satya Pal Malik appreciated Sonam Wangchuk’s effort to demonstrating how civil societies can collaborate with governments and village communities to improve public services like education for lasting impact. Also, creating an environment to keep youths connected with the roots while upholding the values of culture, tradition and moral education. Sonam Wangchuk, Founder, SECMOL highlighted the works and activities of SECMOL. He talked about Operation New Hope, working with communities, government and teachers and introduction of books based on local things and people. These initiative brought changes in the education system and overall development of youths. M.S Sumbli, Rector, Kashmir University Satellite Campus, Leh also spoke on the occasion. A memorandum between Himalayan Institute of Alternatives, Ladakh (HIAL) and Kashmir University and a memorandum between HIAL and J&K Bank for coordinated efforts and financial assistance in the running of the University in Phyang was signed. Meanwhile, scintillating culture performance was also showcased. A skit of 1988 was presented on the occasion by the same artists.